This week fire crews and emergency services have been dedicated to fighting a devastating fire that has affected thousands of people in Andover. The 500m evacuation zone was shortly lifted after the fire crews managed to have the fire under control. The community has pulled together this week following the devastating fire that has shaken Andover. We respect emergency services for their brave willingness to battle the intense fire at Ocado. The scene was un-declared a major incident in the early hours of this morning. 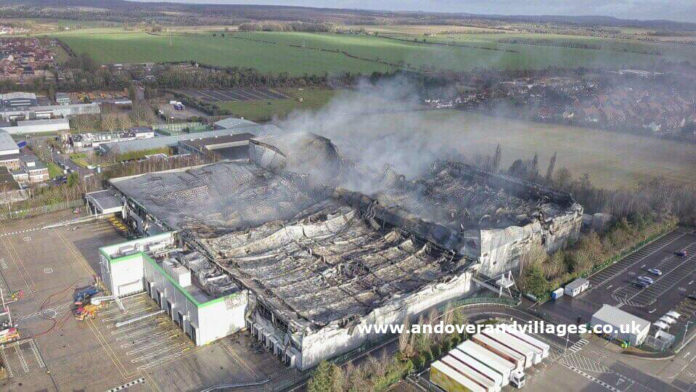 The photos and videos show that the roof of Ocado has completely collapsed following the aggressive fire. The post-haste carried out by emergency services was unbelievable. The ‘complex’ incident was controlled rapidly and with success. It’s unclear what Ocado are planning on doing next. We assume that the building will be professionally demolished. All employees of Ocado remain employed by Ocado. An emergency meeting is being hosted by Ocado for anyone employed by Ocado to discuss matters. The details are on Facebook groups such as Spotted in Andover.